Since TKP seems to be goin crazy over the storm and ECU game I thought maybe I could throw a distraction from all this. The commish of our league, the Fightin Meerkats picked up Bryce Perkins QB UVA onto his roster, looks like he's starting him too since they're playin Ohio. Even if they are playin some scrubs should this be allowed in a TKP fantasy league? My opponent is Hokie Fireman; he auto-drafted Olamide Zaccheus this season. This is my olive branch of solidarity. (It's also a solid troll-job, depending on how you look at it). Playing a UVa player is kind of a weird win-win. If he gets me points that's great; if he throws 8 picks & has a hundred negative yards from scrimmage; that's even better. Well it will help if I can remember how to access and set that roster. 1-1 with doing nothing so far. Stupid CBS didn't change status if Texas A&M kicker before game and still haven't even though he was listed as hurt prior to start of the game! I had 3 players listed as out only until the games actually started. One of them didn't even travel with the team. It doesn't do a good job of giving you any updates, 2 of he guys had apparently been battling injuries during the week but never had them as questionable or gave you a notification that they might sit. The worst. They haven't updated the standings yet. Yahoo has been a little lackluster in updating player notes for injuries and suspensions. It appears they have a few bugs to work out with their projection engine; ROTOWIRE (link). It does appear Rotowire is a bit more reliable with their player updates, so if you have time before Saturday you may want to plug in your starters into their search engine and see if anything pops up. (Searching here seems to run on last name only). Is anyone else seeing all their players on a bye week, or is it just me? No but yahoo didn't alert me to two players on my starting roster being out for the game. They're really bad with that on the college side. Also, those bye week designations fixed themselves once the game started. Probably an air bubble in the system. Please keep both the complaints and suggestions coming. Also, if anybody has any experience with a different CFB league in a different format, please share- I'd like to know how much of this is Yahoo doing a bad job and how much is just harder to keep up with for the college teams. I've updated the tentative standings for week 8, (they don't get updated until the NFL updates on Tuesday morning). The regular season is only 10 weeks in this league, so we're getting close to the playoffs. Next week has a rather interesting slate of matchups. Within each Division, there's a matchup between 1 vs 2, 3 vs 4, 5 vs 6 & 7 vs 8. If there's any good last chance of passing an opponent by beating them, it's this week. 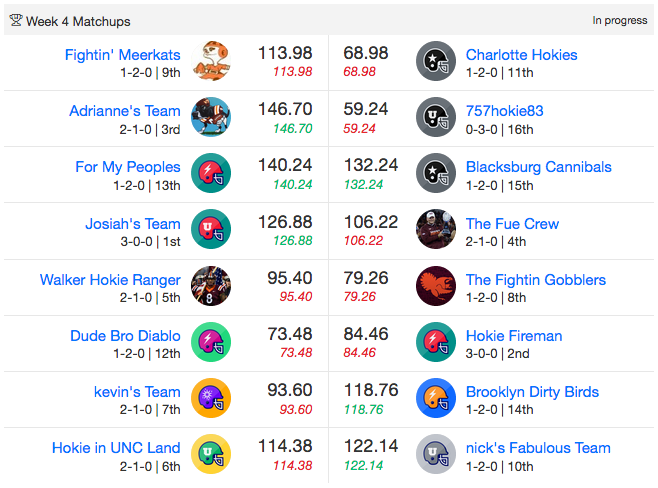 No team has locked up a playoff spot (Hokie Fireman would be subject to tiebreaks if he falls to 7-3; based on current point totals that may knock him out). The first team out is For my Peoples. Peoples would have to score a few extra points and they would be in the picture (with the other 5-3 teams). Kevin's team, The Fightin' Gobblers, Hokie in UNC Land and Dude Bro Diablo are all sitting close at 4-4. 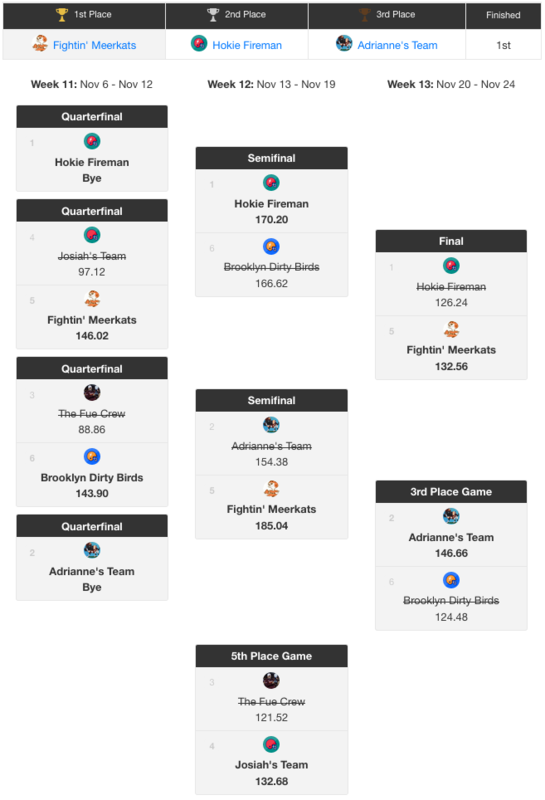 The only way the 3-5 teams can make the playoffs is if Adrianne's Team and the Brooklyn Dirty Birds lose out. You'd be looking to outscore all of the other 5-5 teams in that scenario as well. Hey🙋🏻‍♂️!!! Aren't I in the playoffs right now! Also, if you have more time your analysis about standings and matchups are always fun to read. Can't believe I lost. First loss of the season. Guess you have something in common with Ohio state and Cincinnati this week. Nothing like being 3rd in points scored at 4-4 in the league! With 9 of 10 weeks of regular season (mostly) complete, we have some clarity on the playoffs. He has 8 wins, everyone left in contention has 6. After falling asleep at the wheel and playing 3 players on bye, Hokie Fireman still won this week and is the top seed in the playoff. Nobody else has 5 wins, so the remaining 5 playoff will be comprised of the following teams; all with 6 wins. A six-win team will be eliminated after next week. Even with a disastrous loss next week, the weakest 6-win team will have to make up at least 150 points on these teams. That's not likely; even if they bench their entire lineups. These are the teams most likely to secure the second bye, as long as they win. The only playoff-eligible teams competing against each other are the Fightin' Meerkats and the Brooklyn Dirty Birds. If all of the other 6 win teams are victorious, this will be a play-in game. If any of the other six-win teams lose, the remaining 6-win teams will be selected on point totals. The second bye will go to the 7-win team with the most points (which technically could be the winner of this game if all/most of the other eligible teams lose). Not sure how the hell I not only won but crushed him with having no QB, and a one bye RB and one other player. Next week when they all play I'll lose. Yahoo waivers are currently broken. Please reply here with the players you have applied (and who you dropped) for before Thursday. The last time this happened, they didn't correct it until after Saturday. I will manually adjust the rosters before the first game (if nobody selected plays until Saturday, I'll do it Saturday morning). I tried asking for a link once, never once got to check it. Surprised I ended up with 2 wins. It looks like the waivers just processed. 11/4 Update: The playoff field is set for next week's Matchups. #1 - Hokie Fireman (9-1) had the luckiest team this season, and it wasn't even close. After 7 weeks, Fireman was undefeated despite having an absolutely average scoring output. 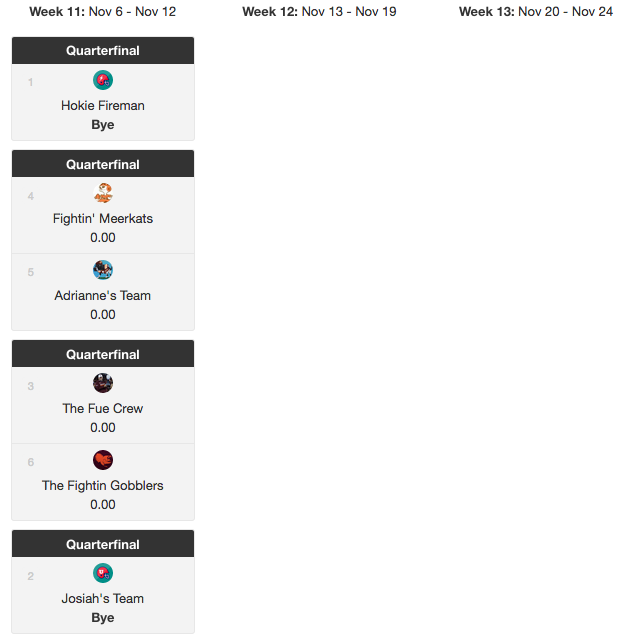 Hokie Fireman lost in week 8, to a DIW team (Dead-In the-Water, a team starting football players on bye and clearly not participating). However, by this point in the season, Hokie Fireman's team was actually starting to become a formidable team. He beat a strong week 9 opponent, "The Fue Crew" while starting 3 players on bye due to excellent output from his remaining players. In week 10, he managed the highest score for the first time this season. #1 – HOKIE FIREMAN (9-1, 115.4 ppg): Hokie Fireman turned around in Week 10 and became the top scorer for the first time this season. For a team so full of luck, Hokie Fireman is also quite the team on the rise. #2 - ADRIANNE'S TEAM (7-3, 138.6 ppg): Adrianne's team came out on fire and had the highest score 3 of the first 4 weeks of this season. The lowest week's score was 119 points, and most commonly scored in the 140-150 point range. #4 – JOSIAH'S TEAM (7-3, 121.7 ppg): Inconsistent outputs have masked a number of dominant showings for Josiah's team, who started the season 4-0 and managed to lose the second bye with a pair of low scoring losses in weeks 8 & 9. #5 – FIGHTIN' MEERKATS (7-3, 117.2 ppg): Less dominant point totals and four wins against DIW opponents mask the results for a team on the decline. For the most part a consistent output around the 115-point is enough to win, but few dominant performances means my team is likely on the way out. #6 – BROOKLYN DIRTY BIRDS (6-4, 114.2 ppg): With a weak start to the season and a 3-3 record, the dirty birds managed to masterfully play the waiver wire (48 waiver moves led the league by a ton) and come out of nowhere in weeks 8 & 9 as the league's top scorer (168.52 & 182.92 points) to earn the final spot in the playoffs over "For My Peoples". 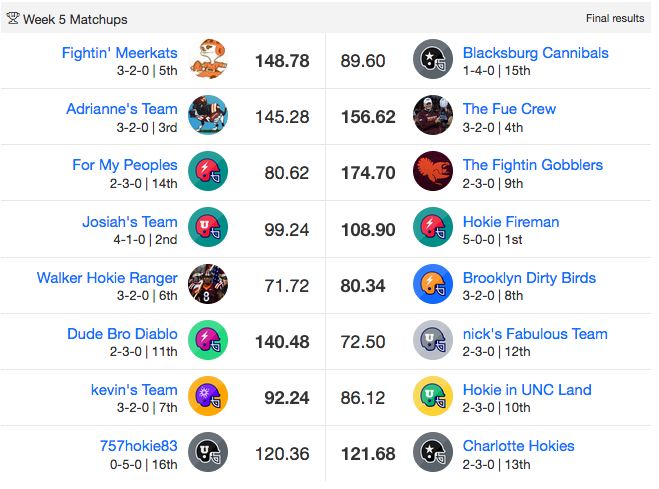 #7 – FOR MY PEOPLES (6-4, 106.2 ppg): With a disastrous start to the season and a 2-3 record, Peoples put together a 4-game win streak, falling just short to Hokie in UNC Land in Week 10 to lose the final playoff spot to the Brooklyn Dirty Birds. #8 – THE FIGHTIN GOBBLERS (5-5, 121.9 ppg): With the third highest scoring output in the league, the Fightin Gobblers managed to draw the short straw for luck this season. In weeks 2 & 3, Gobblers had 140-some outputs against the top scoring teams each week, and from there the bad luck was too much to overcome. A well-earned 3-game winning streak got the Fightin Gobblers back to 4-3 and in the mix for the playoffs, but lost the next to weeks to seal their fate. #9 – DUDE BRO DIABLO (5-5, 119 ppg): With the fifth highest scoring output in the league, Dud Bro Diablo had a strong finish to the season that would have likely resulted in a playoff berth had the weak start been so pronounced. Starting 1-3, a 2-win jumpstart was followed by 2 straight losses. In Weeks 9 and 10, Dude Bro Diablo had two monster wins (182.38 & 150.36 points), but it was too little, too late as the playoffs were composed of only 6 win teams. #10 – HOKIE IN UNC LAND (5-5, 110 ppg): Hokie in UNC Land combined bad luck with inconsistent scoring outputs to put together a team that didn't quite have the potential to make the playoffs this season. A roller coaster 2-4 start was followed up by 2 strong wins to get within striking distance. A week 9 loss to an insanely strong Dude Bro Diablo sealed Hokie in UNC Land's fate (79.18 – 182.38). (Top Players: #6 overall Ole Miss QB Jordan Ta'amu 27 ppg, TA&AM QB Kellen Mond 20 ppg, PUR RB D.J. Knox 16.3 ppg, WVU WR Gary Jennings 15.7 ppg). 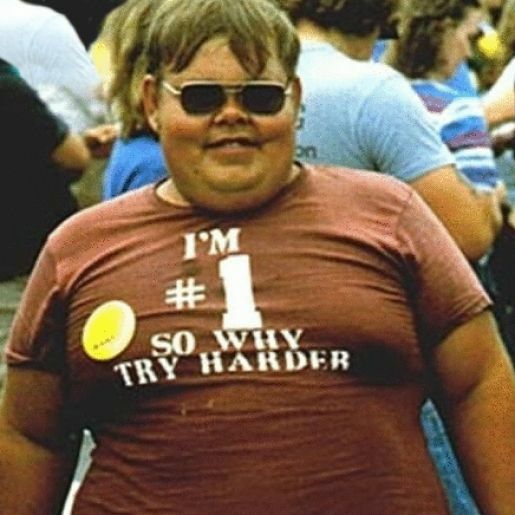 #11 – WALKER HOKIE RANGER (4-6, 113 ppg): The best team name in a league often brings a special kind of luck to a Fantasy Team. Not this season. Walker started with a strong 3-1 record, but managed to stumble right into a 4-week losing streak punctuated by a 178.10 – 205.06 loss to the Fue Crew; a game where the fourth highest scoring output for the season wasn't enough for a win. #13 - CHARLOTTE HOKIES (3-7, 102 ppg): After losing to two of the top teams in weeks 1 & 2, Charlotte Hokies produced a number of close games, but unfortunately came up short more often than not. All 3 wins were <10 point against evenly matched opponents; however many losses were against teams playing their best games of the season. This is for everyone who played their worst against me. Well, the season has wrapped up. If you have any trash-talk or feedback on how to go about this next year (namely, services not named Yahoo! that we could use), please let me know.